The Vegas Golden Knights have locked up another member of their core, signing Alex Tuch to a seven-year extension that carries an average annual value of $4.75MM. Tuch is currently working his way back from injury, and is in the final season of his entry-level contract. He was scheduled to become a restricted free agent next offseason, but will not have to worry about negotiating with the Golden Knights for quite some time. The deal includes no signing bonuses, and will have just a five team no-trade clause during the last three seasons. Tuch, 22, came to the Golden Knights through an expansion draft agreement with the Minnesota Wild, and flourished in his first year in the NHL. In 78 games last season he scored 15 goals and 37 points, while becoming a big body that the team could deploy in almost any situation. With excellent puck skills and creativity, Tuch is more than just a physical presence on the ice, but can likely thank Tom Wilson for at least some of this contract. The team obviously saw the value in having some size up front, and committed nearly as much money to Tuch as to Jonathan Marchessault, one of their offensive leaders. That $4.75MM is a bit surprising for a player who has just 84 regular season games under his belt, but it’s not like Tuch came out of nowhere. Selected 18th overall in 2014, he starred at Boston College for two seasons before making a successful jump to the AHL’s Iowa Wild. Though the 6’4″ winger may not have incredible finishing skills in tight, he can routinely get the puck to the dangerous areas and create opportunities for himself and his linemates. That was no more apparent than during the Golden Knights’ Stanley Cup Finals run, in which Tuch scored six goals including two game-winners in 20 games. His ten postseason points put him only behind Marchessault, Reilly Smith, William Karlsson and James Neal up front, showing just how important he is to the Vegas attack. Still, there’s obviously risk involved here for the Golden Knights. Though the team started with a clean balance sheet and the entire salary cap to work with, they’ve now committed more than $60MM to next season on just 15 players and have huge contracts to negotiate with William Karlsson and Nate Schmidt. They’re by no means in trouble with numbers like that, but they also can’t really weaponize their cap space like they once did, and take on dead money like David Clarkson. 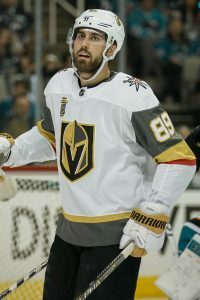 In just a short period of time, the Golden Knights have put themselves in a situation just like most of the other teams in the league, with plenty of money committed long-term. Tuch becomes the eighth player signed at least through the 2021-22 season. Betting on Tuch is another indication that the front office in Vegas believes that last year was no fluke. Though they’re off to a less than stellar start this season, they believe this core is still capable of taking the team to the playoffs and competing there for years to come. That’s why the team went out and signed Paul Stastny in the offseason to replace some of Neal’s outgoing offense, and then traded for and extended Max Pacioretty just before the beginning of the season. The expansion franchise is in win-now mode, while still having a huge pile of draft picks to select over the next few seasons. Tuch will become the fourth-highest paid forward on the Golden Knights next season, though Karlsson is sure to push him down a spot with whatever deal he works out with the team. That’s because with a deal of this length he’s selling off three years of unrestricted free agency, and a chance to make even more money. The young forward wouldn’t have had arbitration rights in 2019, but now won’t even have to consider a long hard negotiation with the team. He’ll now have the certainty of playing in Vegas for a long time, and becoming one of the real faces of the new franchise. Elliotte Friedman of Sportsnet was the first to break news of the contract, while Pierre LeBrun of The Athletic reported details of the no-trade clause. Although the nature of his injury remains a complete mystery, Vegas Golden Knights forward Alex Tuch is headed to the injured reserve. The team announced this evening that the young power forward has been placed on IR, but did not add any further detail to the release. Tuch’s unavailability paired with the recent demotions of Daniel Carr and Curtis McKenzie leaves the Knights with just twelve healthy forwards and an open roster spot heading into their opener, indicating that the team will soon name a replacement to the roster, likely a recall from the AHL’s Chicago Wolves. Meanwhile, Tuch is eligible to return on October 8th, when Vegas travels to his hometown Buffalo Sabres. The Golden Knights will try to get Tuch back to full strength as soon as possible, as the 22-year-old recorded 37 points in his first full NHL season last year and appears primed for a breakout campaign in 2018-19. The Dallas Stars clarified the status of defenseman Stephen Johns today, while also shedding light on their recent acquisition of fellow right-handed defenseman Connor Carrick. Sportsday’s Matthew DeFranks writes that Johns has been dealing with post-traumatic headaches over the past few weeks and the condition has landed him on the injured reserve. While head coach Jim Montgomery indicated that Johns could return to practice as soon as Wednesday – he has only practiced once since September 16th – but there is no timeline for his return to game action. The team will likely take it slow while Johns works through a sensitive diagnosis and in the meantime Carrick can help to pick up the slack. Johns was one of Dallas’ more consistent blue liners last season and the team will welcome him back when he is ready to go. Outside of Johns and forward Valeri Nichushkin, out day-to-day with a lower body injury, the Stars have had good luck with injuries in camp and enter the regular season with a solid depth chart of healthy players. Last week, we noted that the Arizona Coyotes had reached the maximum of 50 contracts for the organization and had technically exceeded the limit with entry-level contracts for Barrett Hayton and Pierre-Olivier Joseph. However, the two youngsters were expected to be returned to juniors which would discount their contracts against the limit. While Joseph has returned to the QMJHL’s Charlottetown Islanders, Hayton has in fact been officially named to the opening night roster, the team announced. How does such a move work? Sportsnet’s Elliotte Friedman reports that Hayton will not count against the contract limit until he has played in the minimum ten games for his contract to toll. As such, Hayton’s stay in the desert could be predetermined to just a short nine-game stint. However, if he wins a long-term spot on the roster, the Coyotes will be pressed to trade away one or more players under contract to make space. Why give Hayton this chance considering their roster inflexibility? Arizona is currently dealing with a laundry list of injuries, with Alex Galchenyuk, Christian Dvorak, and Josh Archibald on injured reserve and Nick Merkley additionally sidelined. The recent first-round pick may present the best opportunity in the system to make up for these losses.